Vvardenfell, an isle of the province Morrowind, has some of the most unique spirits in the world. The land’s unusual flora provide a wide range of local flavors not found elsewhere. The dunmer have a marked preference for these local beverages, and imported wines, liquors, and beers are seldom seen in this region. Comberry is the signature fruit of dunmer wines and brandies, as grapes do not grow locally. Wickwheat and saltrice are the staple grains in this region, forming the base of their liquors and beers. In this book, the most popular alcohols of the region will be covered, as well as dunmer techniques of brewing and distillation. Comberry wine is known to fortify the endurance of the imbiber, but also tends to dull the mind. It is the single most popular table wine in Vvardenfell. It is inexpensive, and perhaps lacks the esteem of the finest Tamriel wines, but has a distinct flavor and local charm. This deep red wine is slightly tart and astringent, but in better quality varieties, this is balanced out by its rich sweetness, and even exhibits a slight hint of fruitiness. Comberry grows in abundance in Vvardenfell, so it is more common here than imported grape wines. Comberry does not have the perfect combination of sugars, yeasts, and tannins for wine making, but they are a close second to grapes, needing only a little extra tending during the first fermentation. Because comberry contains more tannins than grapes, the stems are typically removed before crushing. The comberries are then crushed, and the skins are left in the vat to ferment with the juices, producing a heady wine with a deep red color, known locally as shein. The yeast content present in comberry is not enough to complete fermentation, so a cultured yeast is added to the must. Sugars extracted from marshmarrow are also added to the must, as the comberry does not contain enough. During primary fermentation, a consistently warm temperature is required. After the primary fermentation, the must is pressed, which separates the skins from the liquid. The wine is then placed in a cool place to stabilize before secondary fermentation is begun. The wine is aged in sealed wooden casks for several weeks or months, after which the wine is bottled and ready for consumption. Comberry wine typically has an alcohol content of about 12%. Known locally as greef, comberry brandy is a distillate of comberry wine. It is known to fortify the strength of the imbiber, but tends to make one a little clumsy. Comberry wine benefits greatly from distillation, and its brandies are a much finer quality. Comberry brandy is smooth and clean tasting, with a hint of fruity sweetness. To make this brandy, comberry wine is first selected, then boiled in a pot still, which is a type of large alembic. A diagram of this device is included at the end of this book. Heat is applied directly to the pot containing the wine, and the water is boiled off, leaving a liquor with a higher alcohol content of about 30%. This is called low wine. This process is repeated to further distill the wine, after which the head is removed, which has an alcohol concentration of about 80%. This leaves the heart which is approximately 60% alcohol. The tail, the potion of low wine left over, is mixed into another batch for future use. The heart is then either bottled as common brandy, or aged in wooden casks to produce a finer brandy. Cyrodiilic brandy is produced from the finest grapes of Cyrodiil, and is often imported into the province of Morrowind. Vintage brandy is a comberry brandy that has been cask aged for forty years or more. Ancient Dagoth brandy is another type of comberry brandy that is incredibly rare, as it was bottled during the First Era. It can still be found to this day, and is highly prized by connoisseurs. Mazte is a local ale made from saltrice. It fortifies the strength of the imbiber, but also dulls the mind and weakens the will. Mazte typically has a weak alcoholic content of about 4%, It is a deep red ale that is fairly sweet and malty. This local ale is inexpensive, and the most common beverage in the region. In mazte production, saltrice grains are malted by soaking them until they begin to germinate, after which they are dried in a kiln. The roasting time will determine the ale’s color, typically malted to produce a deep red. The malted grains are called grist, and mixed in hot water to produce the mash. The mash is mixed in hot water for a couple of hours in a mash tun, a large keg with spigot fitted on the bottom. The wort, a sugary liquid, is separated from the grains through a process called lautering. The mash is first heated, then the wort is drawn off the bottom of the mash and added to the top to filter the liquid. Water is then passed through the mash to extract the last of the wort from the grains in a process called sparging. The sweet wort is collected in a large kettle and boiled for an hour. Bittergreen is added at this time as a source of bitterness, flavor, and aroma. The wort is then cooled, and a cultivated top-fermenting yeast is added for the final fermentation. The brew is left in the fermenter for weeks or months until the yeast settles leaving a clear ale, after which the ale is bottled or casked. Sujamma is the most common local liquor, greatly fortifying the imbiber’s strength, but also dulling the mind. This golden liquor packs quite a punch, but it has a smooth and pleasant taste with a slight peaty aroma. It is made from malted and fermented wickwheat, and has a typical alcoholic content of about 35%. Cyrodiilic whiskey is heavily imported into the province and is known locally as flin, fortifying both the imbiber’s strength and will. It is distilled from fermented grain mash of either malted or unmalted barley. It is distilled in a pot still until it achieves an alcoholic strength of approximately 40%. Sujamma and whiskey are made by first malting the grains, then fermenting in a similar manner to beer. The malting process gives sujamma its distinct peaty flavor. It is roasted in kilns fueled by lichens which impart their flavor in the smoke. It is then fermented using a cultivated yeast to produce a wash, a type of sour beer. This wash is then is distilled in a pot still. The wash is heated in the pot still until the vapors pass over the neck of the still where it condenses into liquid. This is then passed through a second still. During the second distillation, only the heart, or middle cut, is collected and casked. Mead, or honey wine, is a popular nord beverage. It is slowly gaining popularity in Vvardenfell since the East Empire Company started exporting it from the nearby island of Solstheim. Pure mead is made with a mixture of honey and water, which is then fermented with yeast, much like other wines. Unlike Yokudan mead, a tradition preserved by the Redguards, nordic mead is not boiled before fermenting. Leaving out this step in the process produces a cloudier beverage, but preserves its natural sweetness. Yokudan mead loses its sugars due to boiling, and must be aged for a minimum of twelve years to reduce its unwanted bitter aftertaste. Nords often drink mulled mead during their winter festivals. Mulled wines, of all varieties, are served warm and have local spices added. Another mead variant is called melomel, which is fermented with fruit to give it extra flavor. Melomel is not traditional to Solstheim, but an increase in trade with Vvardenfell has made comberries available on the island, so a new comberry melomel is slowly gaining popularity with dunmer immigrants. All in all, the dunmer have a rich cultural heritage, and these spirits are an integral part of that heritage. They are best experienced in the dunmer heartland while traveling through the unique province that created them. You’ll be hard pressed to find them elsewhere, as they are not often exported from their homeland. The tastes of Vvardenfell reflect a world set apart from the continent, and a rich wild land yet untamed. 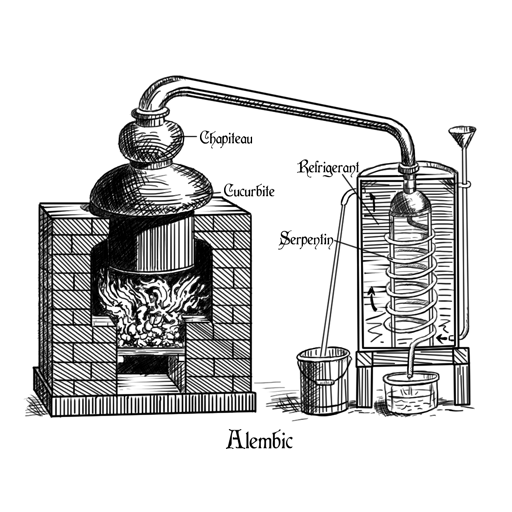 The pot still is based on 18th century illustration.